The Mint Act of 1792 adopted a bimetallic standard, setting a 15:1 ratio between silver and gold. However, the law had no jurisdiction in Europe, where market forces drove the ratio to 16:1 and higher during the early years of the 19th century. Bullion profiteers saw an opportunity in the ratio discrepancy. With 15 ounces of silver, a speculator could obtain one ounce of U.S. gold, which in turn, could buy 16 ounces of silver in Europe. With more silver in his pocket than before, the speculator returned to the U.S. and repeated the process as many times as possible. This scenario seriously depleted the supply of circulating U.S. gold coins. By 1813, the only gold coin still in production was the $5.00 half eagle. This was the preferred denomination of banks, for being held as reserves and for international transactions, but eventually, most of them ended up in the melting pot too. The Capped Head Half Eagle type was released by the Mint starting in 1813 and ran until 1834, but few of them reached America’s streets before heading across the Atlantic. Nearly 1.4 million Capped Head Half Eagles were struck, but precious few exist today due to melting losses. All dates carry great value. 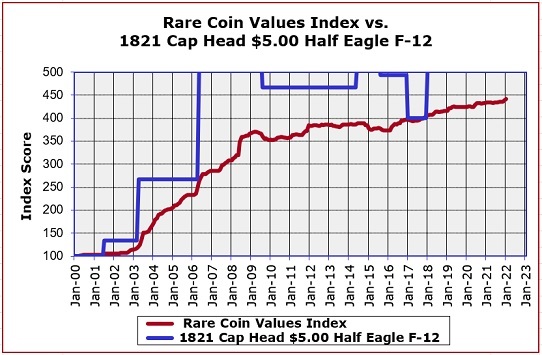 The 1821 Capped Head Half Eagle was chosen to represent the series in our Rare Coin Values Index. The 1821 is actually a bit scarcer than most dates in the series, with an estimated survivorship of somewhere around 20 pieces. In terms of percent value increase over a long period of time, the 1821 is off the charts (see below). The 1821 Capped Head Half Eagle has one of the finest records of value increase in United States numismatics. The blue line above illustrates how strongly the 1821 Half Eagle has increased in percent value since Jan 2000, in F-12 condition. As you can see, it has multiplied in value several times since then, going off the chart for a while. The red line is the percent increase over the same time period of the Rare Coin Values Index, which tracks the performance of a cross sectional group of 87 rare US coins. The Index was created to get a feel for how well the US rare coin market is performing overall. The 1821 Half Eagle is one of the 87 coins included in the Index. All Index data is updated monthly.